Freesat has become very well recognised in many rural areas around Penwith & West Cornwall. Due to the limited service from many Freeview masts, more and more people are turning to this brilliant platform to experience a wealth of High Definition channels and a fantastic problem free service. With over 180 TV & Radio Channels provided, Freesat is a perfect alternative to Sky. With No Monthly Charge. Once the equipment is installed you can relax and enjoy great coverage from the large amount of HD channels available, at no extra cost. 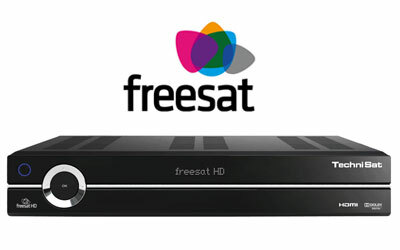 The only requirement to receive a perfect picture with Freesat is a clear line of sight to the satellite. Once the satellite dish has been installed and aligned correctly, you can say goodbye to poor quality pictures for good. We provide a range of different Satellite Dishes to ensure that you maintain a good signal at all times. As we often install in coastal areas, we offer Fibreglass Satellite Dishes with Stainless Brackets to prevent your dish from rusting away. We can also offer Clear Plastic Dishes for less intrusive installations. Should you require a new installation or an upgrade to your existing Sky Satellite Dish, we have the latest signal meters and equipment to provide the best possible signal strength. We provide all types of Freesat Receivers. Including Recordable HD+ Boxes from specialist brands such as Humax, Manhattan & Samsung.